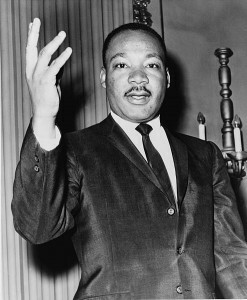 Where do you think Martin Luther King, Jr. would stand on Affirmative Action if he were alive today? Affirmative Action in college admissions will be up for debate again. The Supreme Court of the United States will be reviewing Fisher v. University of Texas in the upcoming term. Abigail Fisher, who is a Caucasian, filed suit against the University of Texas for discrimination based on race. She believes that the University of Texas violated her 14th Amendment right of no state denying any person within its jurisdiction equal protection of the laws. According to “The Washington Post,” more than 50 friend-of-the-court briefs have since been filed. The administration of President Obama is weighing in on the controversial issue as well. The administration wants Affirmative Action as a policy in college admissions to stand. And what do they cite? The “Equal Protection Clause” of the Fourteenth Amendment. They believe that Affirmative Action in college admissions is in fact vital to maintaining the great diversity at America’s universities. What do you think about Affirmative Action as a factor in college admissions? Do you think it should stand? Which group do you think is discriminated against most in highly selective college admissions? Caucasians? Asian Americans? At Ivy Coach, we have a strong opinion on the matter. No group suffers more discrimination in the highly selective college admissions process than Asian Americans. Chinese American appliants. Indian American applicants. These are the applicants who have it rough. And we help them overcome the obstacles in their path. It’s what we do best.